Taking it to the limit, safely and surely: The new Sport mode in Porsche Stability Management helps ambitious Porsche drivers reach the very limits of vehicle control—and the pinnacle of driving pleasure. The red 911 Turbo S approaches the left-hand curve with sheer ferocity. Only at the last instant do the ceramic brakes kick in to powerfully decelerate it. The steering impulse is hard, even ruthless—experienced 911 race-car drivers would know that this is too much of a good thing. There’s nothing to keep the rear end from fishtailing now except for Porsche Stability Management (PSM). Normally, that is. The new PSM Sport mode, however, takes no drastic action. Yet the rear of the car does not turn out. Instead, the 580-hp (911 Turbo S: Combined fuel consumption*: 9,1 l/100 km, Combined CO2-Emission*: 212 g/km), all-wheel sports car seemingly dances into harmless, controlled oversteering. The maneuver looks absolutely controllable—not to mention very fast—much to the delight of Vanina Ickx and Philipp Peglau. 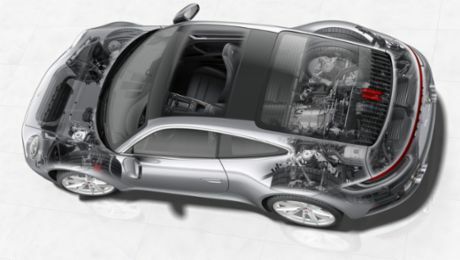 Ickx has the powerful 911 firmly under control. The petite native of Belgium is one of the greats at the wheel. Her talent clearly runs in the family: Vanina Ickx’s father Jacky, for instance, won eight Grands Prix in his Formula One career. His name is even more hallowed in connection with the 24 Hours of Le Mans, where he took the overall title six times, four of them in a Porsche. His daughter Vanina has entered Le Mans seven times, in a 911 GT3 RS as well as at the wheel of various thoroughbred prototypes. She also spent two years as a factory driver in the German Touring Car Masters (DTM). Ickx flashes a brilliant smile as she lets the Porsche slowly coast to a stop. It’s a cold spring day here in Hockenheim at the driving safety center in the middle of the Grand Prix racing circuit, and one might be tempted to warm one’s hands on the wheels of the car. Ickx herself seems to have been warmed just by the drive—taking a 911 Turbo S to the limit is a special experience, even for a race-car driver. “It’s never a simple matter to exhaust the full potential of such a powerful sports car,” she says as her eyes sparkle. “The new PSM Sport gives nonprofessionals the chance to enjoy this great experience too—within a safe framework.” Philipp Peglau beams. Peglau is a suspension engineer. He and his colleagues were responsible for developing the PSM Sport mode. They spent two and a half years on the project, clocking countless miles on all kinds of surfaces—dry, wet, icy, snow-covered—and on all manner of racetracks, including the Arctic Circle Raceway. They didn’t rest until every parameter was so finely adjusted that the results met Porsche’s high standards for all driving maneuvers. Since the introduction of the Macan GTS, the latest generation of the 911, and the 718 Boxster and 718 Cayman, PSM Sport has been available to customers as part of the Sport Chrono Package. At the same time, the safety net is spread considerably wider in the background. If the driver encounters difficulties and the brake pedal pressure exceeds the activation threshold of the anti-lock brake system, PSM switches back on, either more or less quickly depending on the preceding pressure. This “emergency anchoring” function is already similar to PSM-off mode. PSM Sport mode gradually approaches PSM-on mode from 62 to 93 mph. The only thing that can happen now, even at speeds above 93 mph, is an intervention by the traction control system, although this depends on the level of grip on the driving surface.